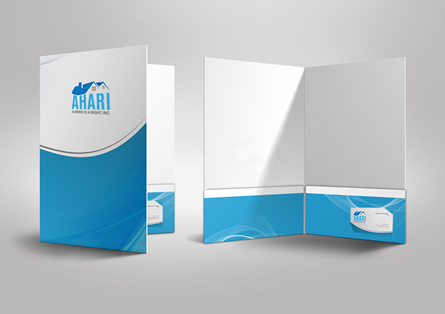 Presentation Folders gives a professional look to any company that their clients will appreciate. It is a great way for a business or organization to stand out from their competition and for their identity to be immediately recognizable. Whether it is compiling reports or sending off a PR package, a customized presentation folder shows off such high professionalism. We print folders with your choice of one or two pockets and the optional slits to hold a business card free of charge. "Mirror Image’s team of designers have been great partners. Love their creativity, and they’re enjoyable people with whom to work"
Need Graphic Design? $125 for a custom design fitted for you. Pricing above includes a slot for a business card at no additional cost to either pocket. Standard turn time is 5-7 business days.